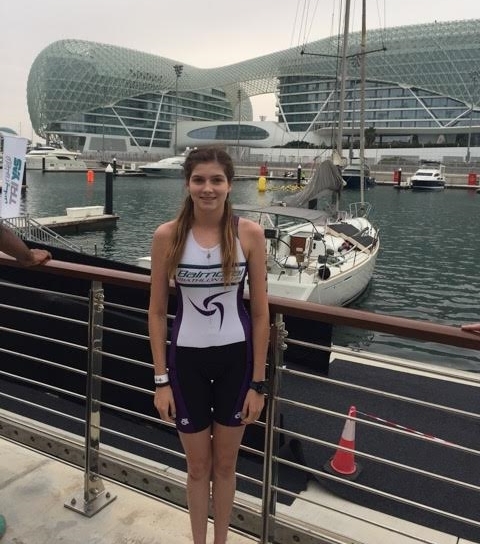 We have received a great Junior Update on Jasmine who trained with BTC in summer and is continuing training and racing overseas in Abu Dhabi. Jasmine started this year doing her first triathlons after only doing aquathons in previous years. Her first race was a duathlon, then a school aquathon at the Emirates Palace, a supersprint triathlon at Jebel Ali in Dubai, Mamzar Supersprint Tri in Dubai, Tri Yas supersprint, ITU Abu Dhabi junior supersprint, ITU Abu Dhabi team sprint (swim leg), Mamzar Open Sprint in Dubai. Jasmine won (along with her team for this event) every supersprint race and came third overall female in her first sprint triathlon race. Jasmine loves her BTC suit and jacket and wears them proudly for training she is also sponsored by H2O (her swim squad) and is an ambassador for the Daman future champions here in Abu Dhabi. It’s a little pond here and she is hoping to swim with the big fish in Oz next year. One girl, Emma Middleditch over from Singapore, was competing at Tri Yas and the ITU here this year, coming a good minute behind Jasmine at both supersprint races. She also went to the ITU Gold Coast this year and we note that she came 6th. From what we can deduce, Jasmine would have had a good chance for 3rd or 4th had she been able to compete at the Gold Coast this year also. We are spurred on by this to try to get up to scratch on how to enter these races and/or the junior series in Oz for next year. Thank you again for your kind assistance and all the support Jasmine received during her great training sessions at Balmoral in summer. We hope to come back during our holidays and next summer. Good luck in your racing Jasmine, we hope you come back and train with us again soon!